Home » Parkside Blog » 2015-2016 is off to a great start! We are thrilled to announce our new Parkside Bus! The bus has a north and a central stop schedule, allowing Parkside to be accessible to families from areas outside of South Austin. The secured front gate is now automated. The Entry and Exit gates will be open during arrival and departure times, otherwise they will remain closed. The sand volleyball court now has a Space Net — an enormous rope climbing structure! The elementary children are going to become monkeys! For the Lower Elementary playground, we have installed a SuperNova, a kinetic play structure similar to a merry-go-round. The Primary playground received the Daisy, a springy 4-seater. We started off the year with our first-ever Back-To-School Community Picnic! This opportunity for the whole family to come and explore the campus, meet new faces, reconnect after the long summer break and get questions answered was a resounding success, and is likely to become a tradition. It’s wonderful to see families coming together on our campus — parents connecting and meeting new faces — children smiling, running and playing together. What a special way to begin the year together as a community! Elementary Specials have started, bringing the children Martial Arts with Doug Diamond, Classical Guitar with Tom Echols (for third years and up) and Spanish with Jacqui Moreno. We do our best to bring families together at Parkside. We are offering some new programs this year as well as bring back old favorites. Bike Club — New to Parkside this year is our Bicycle Club! Our goal is to create a weekly afterschool group that takes off and rides nearby trails. 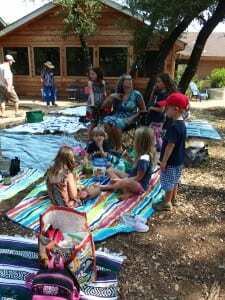 Families in Nature — Our Parkside Family in Nature group has an activity every 3rd Sunday of the month, plus access to the other activities Families in Nature offers. Check out Heather’s (founder of FiN and Parkside Alumni Parent) recent post – Choose Nature, Together. Soccer Shots — Parkside will be offering Soccer Shots for our Primary and Lower Elementary children on Mondays and Fridays after school. Parkside Sparks (formerly Marathon Kids) — Parkside is creating our own running program called Parkside Sparks. This program introduces children to the fun of running and helps them to understand that a short run each day adds up over time. Over the course of 6 months, they will have run a full Marathon! We kicked off the year with our first Simple Gifts Ceremony on Friday. It was a little warm and muggy, but the magic of coming together to sing and dance was strong! Let us know if you’d like to join us for Simple Gifts one Friday morning, it’s a great way to start your day!